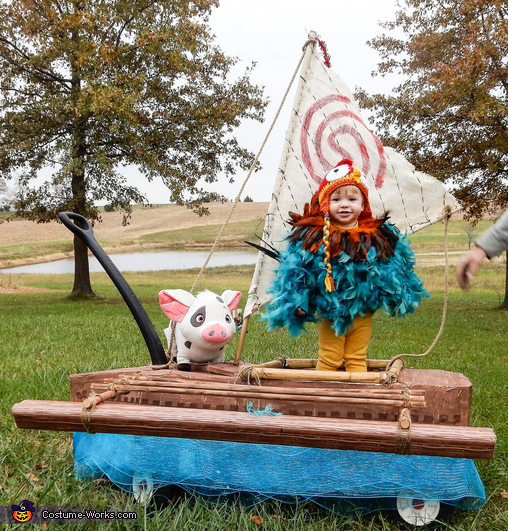 My 19 month old loves moana and he has such a goofy personality plus I feel like I'm always yelling HEY HEY at him so hei hei is a very fitting costume. His hat was hand knitted, the body of the costume I created by sewing feathers to the front and back of a yellow long sleeve shirt. I created the tail feathers by carving down a piece of cardboard then attaching feathers to it and Velcro to attach it to the back of the pants. his feet I also hand sewed. the boat was created out of cardboard and painted to look like wood. I hand cut the sail and sewed to dal rods. Are the fathers just on a tshirt? I lovvvvvveeeee the costume it came out fantastic!!!! It looks.so fluffs to be a tshirt. How many feathers did this costume take?! What size of feathers did you use? How many?